I was just thinking this weekend about how it's been a long time since we've had any type of romantic comedy, legitimately fun despite its conventions or not. There are no marquee male stars to headline these things anymore and the closest we seem to get presently are either riffs on the genre a la last summer's Trainwreck or the dredge that is director Garry Marshall's holiday-themed movies that intertwine multiple stories and feature as many stars as possible so that the financial success doesn't hinge on a single name (we get Mother's Day at the end of this month if you're curious). So, I began to wonder what a modern romantic comedy might look like and without considering the aforementioned films that are more or less derivatives of the original template the closest thing I could come up with was Brooklyn. Yes, last years tale of an Irish immigrant who lands in 1950s Brooklyn where she falls in love with a local Italian is the closest I could come up with. Clearly, this isn't in the same genre as those Matthew McConaughey headliners from the mid-2000's though, and so my thoughts extended even further into the genre of grand romantic films in general. A genre the Nicolas Sparks-based The Notebook reinvigorated in 2004, but has since become something of a parody of itself with the continued adaptations of Sparks' novels turning into rote, cheesy reminders of how great Ryan Gosling and Rachel McAdams were together. One movie looks to buck that trend this year though. 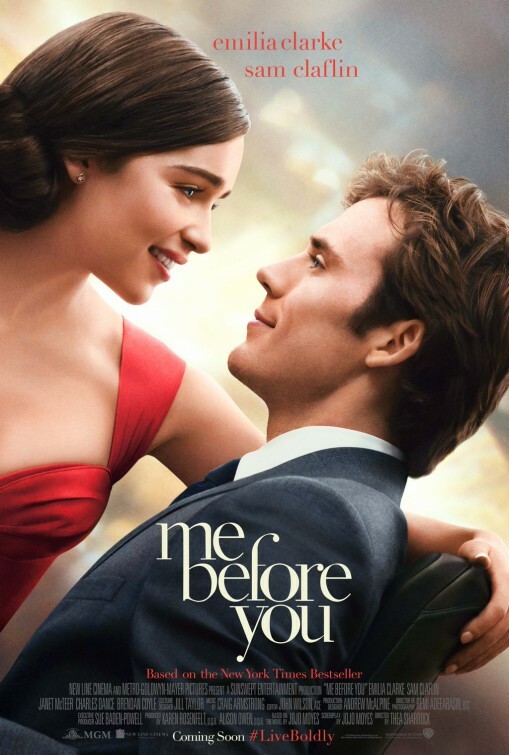 Me Before You is an adaptation of the hugely popular novel by Jojo Moyes and is being brought to the big screen courtesy of theater director and Call the Midwife alum Thea Sharrock making her feature directorial debut. Emilia Clarke (Game of Thrones) and Sam Claflin (The Hunger Games) star in this story of a girl in a small town who forms an unlikely bond with the recently-paralyzed man she's taking care of. The film also stars Jenna Coleman, Janet McTeer, Matthew Lewis, Charles Dance, Vanessa Kirby, Stephen Peacocke, and Brendan Coyle. Me Before You opens on June 3rd, 2016.